Here you can get the Himachal Pradesh Board Class 8, 10 and Class 12 Exam Schedule. 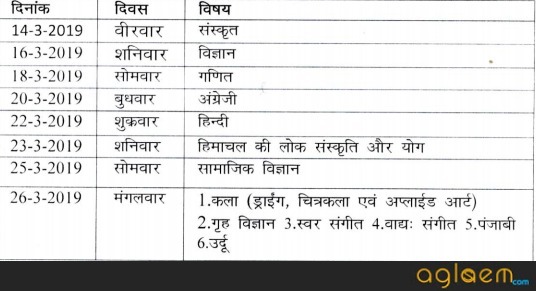 Himachal Pradesh Board of School Education is going to conduct the examination of the regular and open school of Class 8th, 10th & Class 12th. The complete date Sheet of Class 10 & 12 has been available on the page. Latest: HP Board has released revised practical datesheet for class 12th, visit respective pages to check the same. Candidates can check the schedule for Class 8, Class 10 and Class 12 Exam here. The exam will be conducted in two different sessions, i.e. in the morning & afternoon. The morning session will be held from 8:45 AM to 12:00 Noon (for regular & private). The afternoon session will be organized from 1:45 PM to 5:00 PM (for SOS). 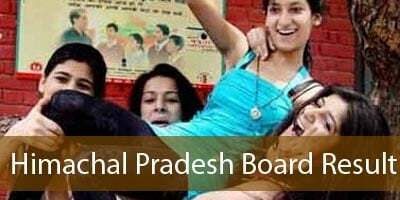 Himachal Pradesh Board of School Education is an agency of Government of Himachal Pradesh entrusted with the responsibilities of prescribing courses of instructions and text books and conducting examinations for secondary school students in Himachal Pradesh. It was set up in 1969 and has its headquarters in Dharmshala. Kultar Chand Rana from Kangra was the first chairman. At present more than 8000 schools are affiliated with the Board. The Board sets up 1650 examination centers for over 500,000 examines every year. Sh. Ashwani Raj Shah (HAS) is the current Secretary of the HPBOSE appointment by the Government of Himachal Pradesh.